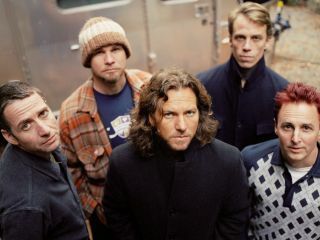 Recently, Pearl Jam collaborated with MTV Games and Harmonix to create a Rock Band version of the grunge rocker's iconic album Ten. Now, the gang is getting together again - this time to create a live Pearl Jam Rock Band project that will feature cuts from the group's entire catalogue. The game isn't due until 2010, and that's fine - because Pearl Jam are bringing Rhapsody into the fold, allowing fans to vote for their favorite versions of songs, which means we're talking hundreds of performances from over the years. As the band says on their website, "You've got your work cut out for you." To listen to the myriad of live Pearl Jam tracks and register your votes, click here.